ne of the greatest preachers in America was a Boston boy. His name was Phillips Brooks, and there is a fine statue of him near Trinity Church, where he was rector for twenty-two years. When Phillips was a little boy, he and his five brothers made quite a long row, or circle, when they sat at the big library table learning their lessons for the next day's school, while their happy-faced mother sat near with her sewing, and their father read. The Brooks boys had all the newest story-books, games, music, and parties, so they were a very jolly lot, but it is Phillips I want to tell you the most about. Phillips liked books better than play and was such a bright pupil that his teachers were always praising him. In fact, he was a favorite everywhere. It did not make much difference whether he was spending his vacation in Andover with his Grandma Phillips, walking across Boston Common with his mother, or hurrying in the morning sunshine to the Boston Latin School, people who looked at his handsome face and his big brown eyes said to themselves: "There goes a boy to be proud of!" It was just the same when he went to Harvard College. He was such a likeable chap that he was asked to join all the clubs and invited to the merry-makings of the students. But he was rather shy. Perhaps he had grown too fast, for he was only fifteen years old and six feet, three inches tall--think of it! He stayed in his own room a good deal, writing and trying for prizes. He won several. He did not like arithmetic or figures of any kind, but anything about the different countries or the lives of men and women would keep him bending over a book half the night. Things had gone pretty easily for Phillips up to the time he graduated from Harvard. He had always found faces and voices pleasant. So you can see how hurt he must have been when the very first time he tried to teach school the pupils were ugly and rude to him. It almost broke his heart that they did not want to mind him. The smaller boys loved him and took pride in learning their lessons, but the older ones hardly opened their books. Instead of that they spent their time making the young teacher's life miserable. He was only nineteen! Poor fellow, he must have wished many a day that he was at the North Pole or the South Seas instead of in Boston. These rowdies threw heads of matches on the floor and grinned when they exploded; they piled wood in the stoves until every one gasped for breath; they fired wads of paper at each other; and once they threw shot in Phillips's face. The principal of the school beat his boys when they did not behave, and he had no patience with Phillips for not doing the same. But Phillips could not do that. He finally said he would resign. Some principals would have said to the young teacher: "Now, don't mind it if you have not done very well at teaching; there are, no doubt, other things that you will find you can do better than this. Good luck to you--my lad. Remember you have always a friend in me!" But Phillips's principal glared at him and declared: "Well, if you have failed to make a good teacher, you will fail in everything else." Just then Phillips did not think of much else but his own disappointment. His father and his five brothers were very successful at their work and it shamed him to think he was not. Phillips's brown eyes were very serious in those days. The same ones who had once sighed: "There's a boy to be proud of," now showed no pity in their looks, and often hurried down a side street to avoid bowing to him. Dear me--and it was the very same boy they had praised when he was taking prizes! Phillips began to feel that he would like to help the people in the world who had the heartache. There seemed to be plenty to help the happy, rich folks, but there were many others who he was sure needed a friendly word and hand-clasp to give them new courage. His pastor advised him to become a preacher. This meant more study. So he went to a seminary down in Virginia, where men fit themselves for the ministry. He got there after school had begun, so he had to take a room in an attic. There was no fire in it, poor light, and he, with his six feet and three inches, could not stand up straight in it without bumping his head against the rafters. And his bed was not nearly long enough for him. It is a nuisance, sometimes, to be as tall as Phillips was. But he never minded all these things. He only felt in a hurry to finish his studies so that he could preach and work among the poor. After he had preached at two churches in Philadelphia, he was asked to be the rector of Trinity Church in Boston. He was rector there for twenty-two years--until he was made Bishop of Massachusetts. He spoke so beautifully from the pulpit that strangers traveled from all parts of the country to hear him. So many flocked to Trinity Church that the pews would not hold them. Chairs were packed in the aisles, and a few more people managed to hear him by squeezing on to the pulpit steps. Phillips Brooks's sermons were wonderful, but his work among the sick and the poor was more wonderful still. He carried help and good cheer with him every day. The more good he did, the happier he grew himself. His laugh rang out like a boy's. By the time he was made Bishop, he was so merry that he could hardly contain himself. He helped poor men find work; he held sick children while their mothers rested; he coaxed young men away from bad habits, and, like his Master, he went about doing good. He did not look sober or bothered with all this, either. There was always a smile on his face. 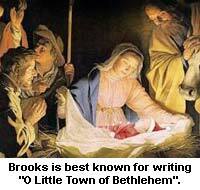 Phillips Brooks had no wife or children but several nieces. At his home, on Clarendon Street, he kept a doll, a music-box, and many toys for them to play with. Every little while, when he was all tired out with his preaching and his cheering-up work, he would take a long trip to some distant country, and from all these strange places he would write letters to these nieces which made them nearly explode with laughter when their mothers read them aloud. All the funny sights in Venice were described, and the stories about the children in India made the eyes of Susie and Gertrude Brooks open their widest. At the end of almost every letter he would charge the little girls "not to forget their Uncle Phillips." As if any one who had ever known Bishop Brooks could forget him! But Christmas time was the best of all for these little girls. Their uncle Phillips took them right along with him to buy the presents for the whole family. This would be weeks and weeks before it was time for Santa Claus, so he would make them promise not to lisp a word of what was in the packages that arrived at the rectory. They loved sharing secrets with him and would not have told one for any money. That was a strange thing about Phillips Brooks--he made people trust-worthy. He always believed the best of every one, and no one wanted to disappoint him. Sometimes when the girls and their uncle started on one of these entrancing shopping tours, it did seem as if they would never reach the shops. So many passers-by wanted a word with the great preacher they had to halt every other minute. I have no doubt his smile was as sunny for the Irish scrub-woman who hurried after him to ask a favor as it had been for good Queen Victoria when she thanked him for preaching her a sermon in the Royal Chapel at Windsor Castle. Because his heart was filled with love and sympathy, Phillips Brooks left the world better and happier than he found it. Now, if every one who passes his statue at Trinity Church should say: "I really must do some kind, generous thing myself, each day in the week," there would be sort of a Christmassy feeling all the year round, and we should keep a little of the sunshine which the Bishop of Massachusetts shed, still shining.